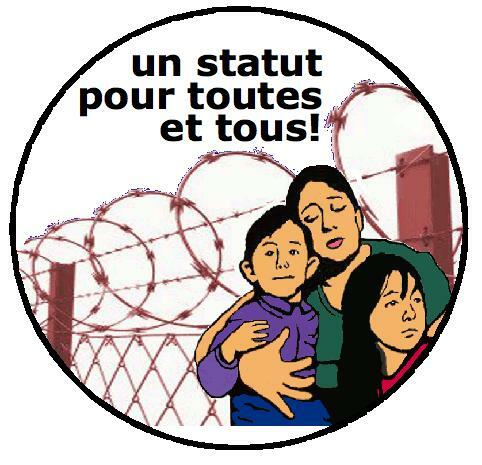 “Status for All” means that we demand a full, comprehensive and ongoing regularization program for all people living in Montreal, Quebec and Canada who do not have full status (ie. permanent residence or citizenship). “Regularization” programs have been called “amnesties” in other countries, but we prefer not to use that term, since migrants don’t need to be excused or pardoned for exercising completely legitimate and understandable choices to migrate to another part of the world, whether for economic or political reasons. Undocumented migrants and temporary workers are the most exploited in the workplace and in society. Their existence creates an fundamentally unjust reality within our communities, whereby some people are able to access basic rights and services – like education, health care and workers’ protections – and others cannot. An individual who is non-status, or who does not have full status as a resident, can be more easily exploited because they live in fear of being removed. They often live their lives within our communities in fear and isolation. In the past, providing rights and services to some people, while systematically denying those rights and services to others, was justified by appeals to racism, or false ideas of cultural superiority or exclusiveness. But, in the 21st century, providing rights and services to some but not others is a hallmark of apartheid. Individuals and families migrate for completely understandable and legitimate reasons. By demanding Status for All we reject global apartheid and internal apartheid, and instead stand in solidarity with all migrants. By demanding Status for All we want to break the fear and isolation associated with the reality of being a non-status person. A Status for All demand rejects the divide-and-rule tactics used by the state to classify migrants as “deserving” versus “undeserving”, or “good” versus “bad” immigrants. We aim to create genuine solidarity and support between all migrants, whether they are new immigrants, undocumented workers, refugees, or temporary workers. Simply put, Status for All means that all residents of Canada will get the documentation they need (to be permanent residents and citizens) so they can access all services and have recourse to all the same rights as anyone else. Essentially, Status for All means we struggle and organize so that all residents, regardless of their origins, can have full dignity as human beings.